Natural stone boulder retaining walls are in vogue at the moment. Retaining walls made of stone boulders have gained popularity among Calgary residents. Why? Not only do they have an enchanting quality, but they’re also amazingly sturdy and robust. People use them for various purposes. Some clients need them to strengthen sloped terrains. Some opt for them just for decorative purposes. Others use them to mark the boundaries of their plot. The most common function of boulder retaining walls is the prevention of soil erosion. Take a more in-depth look and find out more about how natural stone boulder retaining walls can benefit your yard. Boulders are natural stones found in a range of sizes, shapes, and colours. 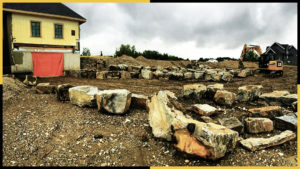 These stones are frequently used to build retaining walls primarily due to their ability to fit into any outdoor space. They can also provide the area with unparalleled natural beauty. You will find boulders around water features in gardens (like waterfalls, garden ponds and the like), pools, zen gardens, and so on. Another factor that makes boulders extremely popular as a component used in landscaping is the broad variety of textures and colours in which they are available. Boulders are shaped naturally by glaciers and water. Thus the textures they feature are always unique. This element of boulders allows landscape designers to create exciting and distinctive visual effects. There cannot be a better material than natural boulders when it comes to constructing retaining walls. That’s because no other natural stone can combine appearance with functionality as efficiently as big, naturally-formed boulders. If the place you are located in boasts a sizeable natural slope, having a sturdy supporting structure becomes extremely important. The structure may play a double role. Ideally, it should make the region more aesthetic, and help in protecting the land against erosion. You can use these walls also for dividing sloping land areas into visually enhanced, functional horizontal zones. You can also create a personal garden to grow plants and herbs, or keep it a simple green lawn that surrounds your abode. You can use various materials to construct a supporting structure in your garden. Examples include wood, brick, cinder blocks, concrete and the like. There are also various stone types that are used for this purpose. However, none of them come with the qualities that boulders possess. Retaining walls built using boulders make the most of the aesthetic value of these stones. Besides, boulders are exceedingly strong and are frost-resistant. Boulders can also withstand aggressive environmental hazards and sudden temperature changes. Retaining walls made up of these textured stones add character and rustic charm to a home’s exterior. We already mentioned that boulders are found in a range of shapes. Landscaping companies decide which shape would be suitable for a particular project depending on the needs, taste, and preferences of the client. For instance, tall stones make great additions to rock gardens or gardens featuring waterfalls. You can even use them to form a retaining wall’s base. The low, massive vertical boulders are also great for constructing the base of retaining walls as they are heavy and strong. It would be wise to go for natural boulder rocks instead of manmade ones as the former can provide you with aesthetic uniqueness. However, make sure that the boulders you are using score heavily when it comes to both visual appeal and strength. Large boulders are exceedingly heavy. So, to reduce transportation costs, you should pick a local source to get all the boulders required for building a retaining wall to your garden. Before placing your order, however, you must find out the number of boulders you will need to complete the job. Consider the desired height and length of the wall you are looking to build. Ideally, you should buy boulders of various sizes from small to large. This would make shaping the corners much more accessible. Also, your landscape designer should also be able to add more wall variations. Before initiating the project, it’s important to check the local laws about the construction of retaining walls. Also, obtain the required permits from your local authorities. If you have decided to build the wall yourself, get a sketch of your desired retaining wall ready before starting the job. Also, list all the measurements accurately. We would not encourage you to make this one a do-it-yourself project as such jobs require significant technical knowledge. For instance, only experienced Calgary landscaping companies would be able to tell you whether you need to remove any tree or underground electricity/water lines to build the wall. The process of construction begins by setting up a solid foundation. Workers would dig up the soil either by using a digging machine or with a shovel. They follow this process by forming a 4-inch layer of gravel, which the Calgary landscape contractors will compact to add solidity to the wall’s base. They would also cover the gravel with a sufficient amount of sand. Now, it’s time to arrange the boulders. The workers would begin by placing the biggest boulders first. Smaller boulders are typically used at the higher levels of a retaining wall. Thanks to their incredibly heavy weight, you will need to hire extra men for transporting the large boulders. Construction of a natural boulder retaining wall is unlikely to involve the use of mortar. That’s because the weight and shape of boulders ensure that walls made with them will be strong. The next factor that plays a vital role in this construction project is drainage. It’s true that a boulder retaining wall would offer natural drainage. However, the Calgary landscapers that take your project on must still leave enough gaps between boulders so that water gets drained smoothly. Once all large boulders are appropriately placed, you should fill the gaps between them with smaller boulders. This provides additional support to the retaining wall and makes it stronger.